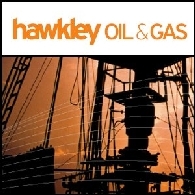 Asian Activities Report for October 20, 2011 includes: Hawkley Oil and Gas Limited (ASX:HOG) announces a three-fold increase in the remaining 2P reserves in the B18b gas accumulation in the Sorochynska Field in Ukraine; Jameson Resources Limited (ASX:JAL) has signed agreements to acquire Canadian coal assets; Dragon Mining Limited (ASX:DRA) announces the final results from the fourth phase drilling programme on the Juomasuo deposit at the Kuusamo Gold Project in northern Finland; Molopo Energy Limited (ASX:MPO) has commenced drilling the Parker South 85 exploration well in its Wolfcamp acreage in West Texas. Asian Activities Report for April 18, 2011 includes: Conquest Mining Limited (ASX:CQT) announced strong production at the Pajingo gold mine in Queensland in the March Quarter; Firestone Energy Limited&apos;s (ASX:FSE) Waterberg Coal Project will be funded by the Industrial Development Corporation of South Africa; Jameson Resources Limited (ASX:JAL) is to acquire up to 100% of the Crown Mountain Coal Project in Canada; BrightStar Resources Limited (ASX:BUT) is to earn 75% of the Miyabi Gold Project in Tanzania. 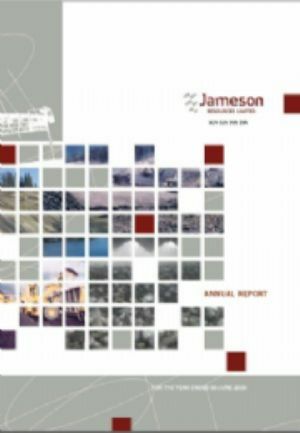 Jameson Resources Limited (ASX:JAL) is pleased to provide a Quarterly Activities Report for the period ended 31 December 2009. 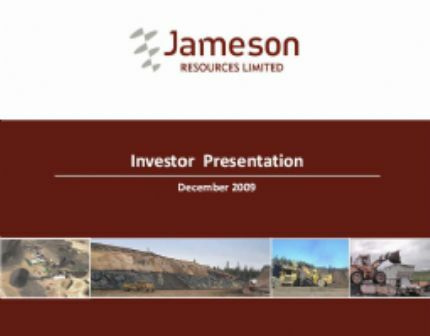 Jameson Resources Limited (ASX:JAL) would like to announce that it has amended Norwest Corporations ("Norwest") brief to complete the feasibility study on the expanded mine case at an optimal annual production rate. It has been advised that construction of a new wash plant facility will require only slightly more capital than upgrading the existing wash plant to a standard capable of producing an export quality product at an increased capacity. 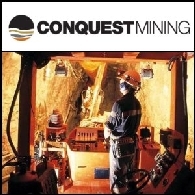 Norwest Corporation ("Norwest"), a leading international consulting group is undertaking a feasibility study on behalf of Jameson Resources Limited (ASX:JAL) to recommission the Basin Thermal Coal Mine ("Basin" or the "Project") in British Columbia. The study is targeting an initial production rate at the permitted capacity of 250,000 tonnes per annum with a rapid staged expansion to approximately 1million tonnes per annum. Jameson Resources Limited (ASX:JAL) is pleased to announce that leading coal quality evaluation consultants Khan and Associates have confirmed that the Basin Coal is of suitable quality for a PCI product or as an enhancing component for the PCI market. 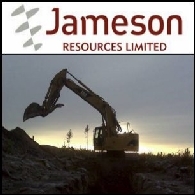 Jameson Resources Limited (ASX:JAL) is pleased to announce that it has recently entered into a Sale Agreement to divest its Ora Banda gold assets to Winchester Resources Limited ("Winchester"). Winchester is an Australian public company which intends to raise A$2.0 million via an Initial Public Offering on the ASX. 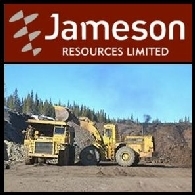 Jameson Resources Limited (ASX:JAL) is pleased to announce analytical test work from the trenching program at the Basin Coal Mine ("Basin" or the "Project") in British Columbia has been completed. Norwest Corporation ("Norwest") will be utilising the results from the washability and other tests undertaken to assist in the plant design as part of the recommissioning study, now anticipated to be completed early in the 4th quarter. 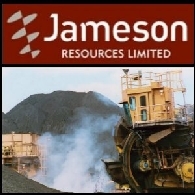 Jameson Resources Limited (ASX:JAL) advises that it has filed a Technical Report in relation to the updated coal resource estimate on the Basin Thermal Coal Project. The report dated September 4, 2009 has been filed onto the Canadian System for Electronic Document Analysis and Retrieval ("SEDAR") by the project vendors, Compliance Energy Corporation ("Compliance"). 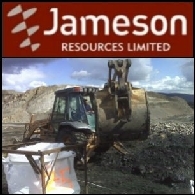 Jameson Resources Limited (ASX:JAL) advises that it has filed a Technical Report in relation to the updated coal resource estimate on the Basin Thermal Coal Project. The report dated September 4, 2009 has been filed onto the Canadian System for Electronic Document Analysis and Retrieval ("SEDAR") by the project vendors, Compliance Energy Corporation (&apos;Compliance&apos;).